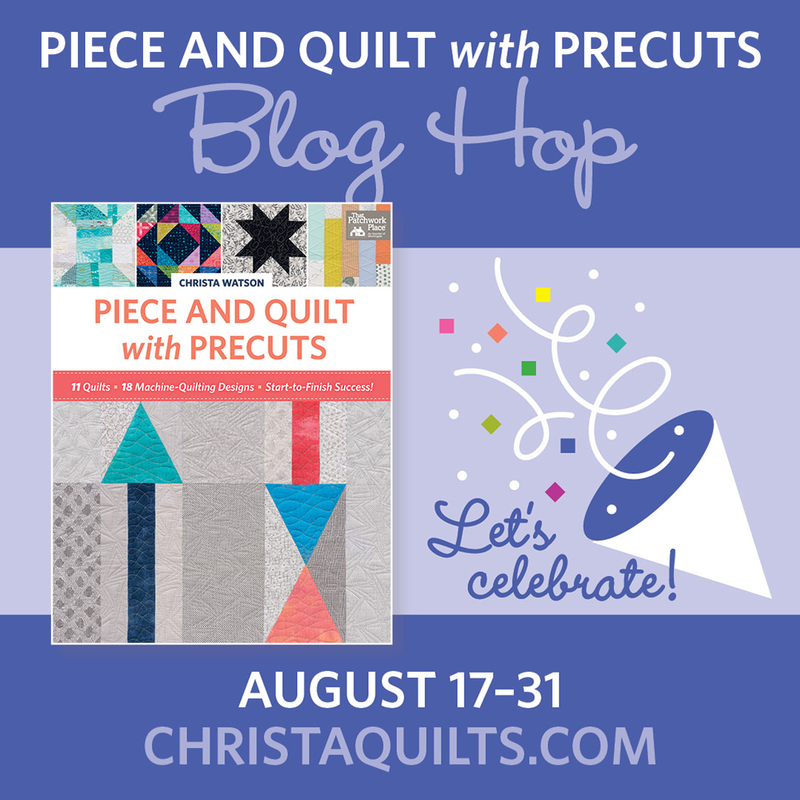 Websterquilt: Piece and Quilt with Precuts Blog Hop and Giveaway! 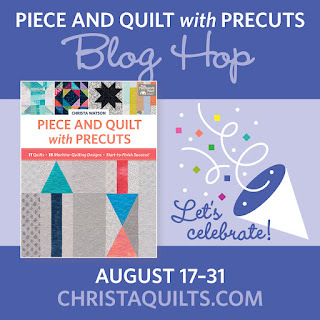 Piece and Quilt with Precuts Blog Hop and Giveaway! 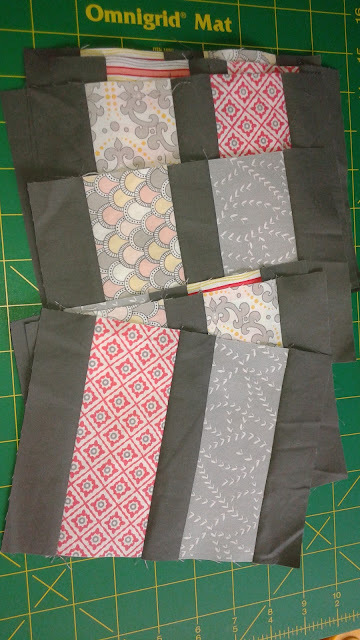 I had the great fortune to make Christa's quilt Windows from her brand new book Piece and Quilt with Precuts! I made mine about half the size of the full pattern to fit on my sewing room door. I started with some fun strips. 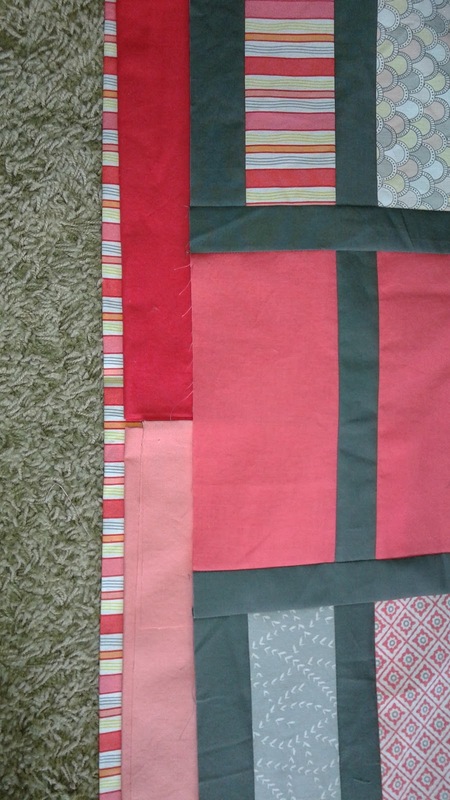 I had enough of my background fabric to make a really large table runner or bed runner. I'm going to hang it on my sewing room door as it's about the right size for that. I laid out the pieces to make sure my colors were all spread out. Christa's directions are really clear and easy to follow. 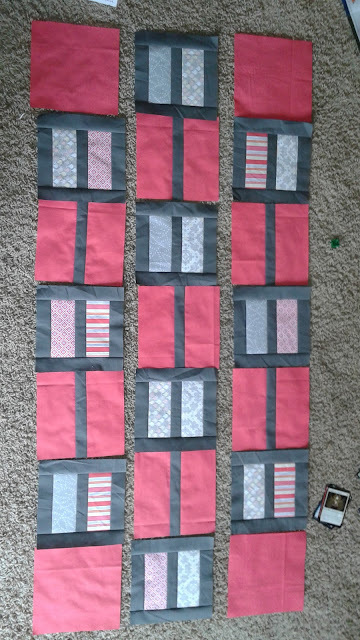 I ran out of my background fabric, but had two similar shades of pink to choose from to put on a final border. I opted for the darker color instead of the light. Then I got to have fun quilting my quilt! Christa has great suggestions in her book. 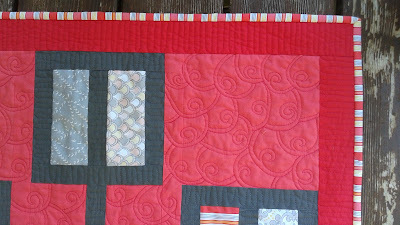 I am not as good at stitching Crazy Eight quilting as she is so I opted for matchsticks in the gray and outer border and then did a design on my own, arc swirls in the background. I also used a striped binding which just adds so much sparkle! The final quilt all ready for my door! 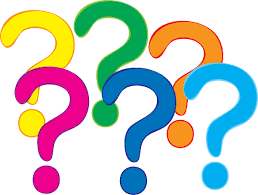 You can also leave a comment to be entered for a free ecopy of Christa's book! Your quilt is beautiful. I love the background and border colors. You did such a great job with it and the quilting looks awesome! Looking at all the projects on the blog hop makes me want to give it a try! I agree that that striped binding is terrific. Thank you for sharing your project. I love the look of the striped binding. 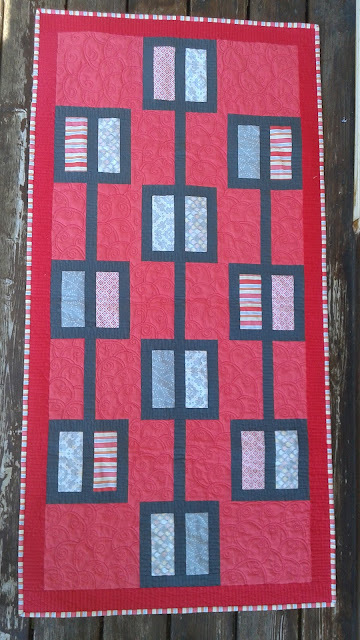 I love the idea of hanging a quilt on the back of my sewing room door! Looks fantastic. Love your color choices!! 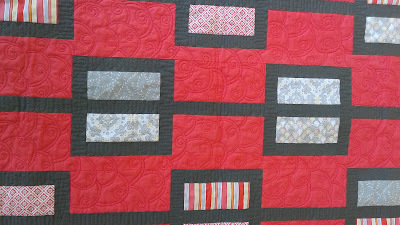 Gorgeous quilt, I love your color combination! Great quilt, love the color choice. What a beautiful quilt! I love the idea of sizing it to fit on a door! Great to see your quilt and clever spot on your door to feature it. I love the striped border, and the darker pink really pulls that color from the stripes and makes it zing! Door quilts are great, I have them on my sewing room door. Strips are fun to use in bindings. Is the rafflecopter not working? It would not open for me. What a great idea -- to make a door hanging! It looks great! Very nice--I'd love to see your flow pattern for the quilting that is in the red areas. I really like it. 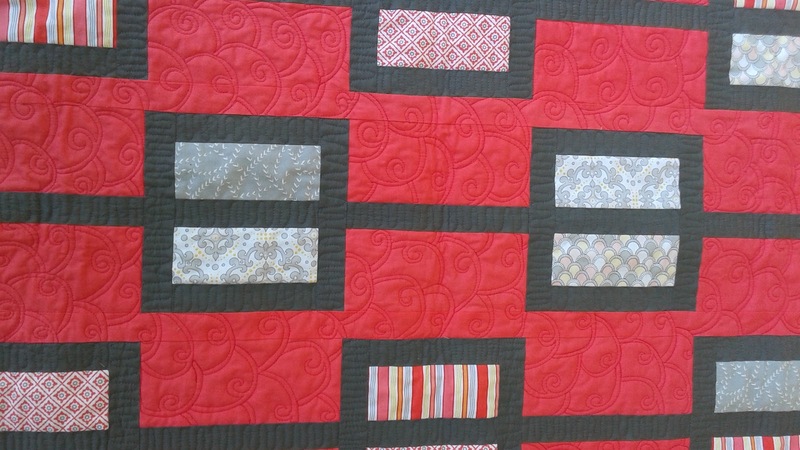 I love your version of Christa's quilt, both your colors and your clever quilting. Is the rafflecopter supposed to work? I have really enjoyed seeing the different options. Thank you for sharing! Nice idea making a door quilt! Love your quilting. Looks great for a door quilt. I often use a table runner to fill a narrow wall space. What a wonderful idea!... to put a special quilt on a sewing room door! I love your quilt and the colors. Love the idea of putting it on your sewing room door. Thanks for sharing how you used the pattern. Love your colours. I would love to try out all of the quilts in this book! Very contemporary pattern. 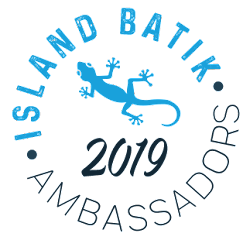 Would love to see in batiks. Never thought of a door quilt. Awesome job on this door quilt from your fabric choices to the quilting! Thx for sharing! Love it. No rafflecopter, though. I like your door quilt and the quilting. Great door hanging! 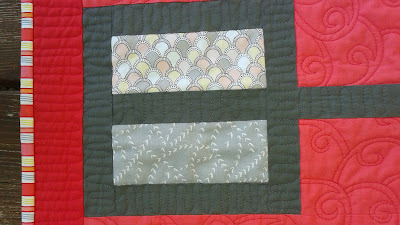 the separating strip creates a nice sense of movement ~ ~ augmented by your interesting quilting! I like it. love the door handing and this design! The striped binding is so perfect. I love the red background. I'm going to use it on a quilt soon. 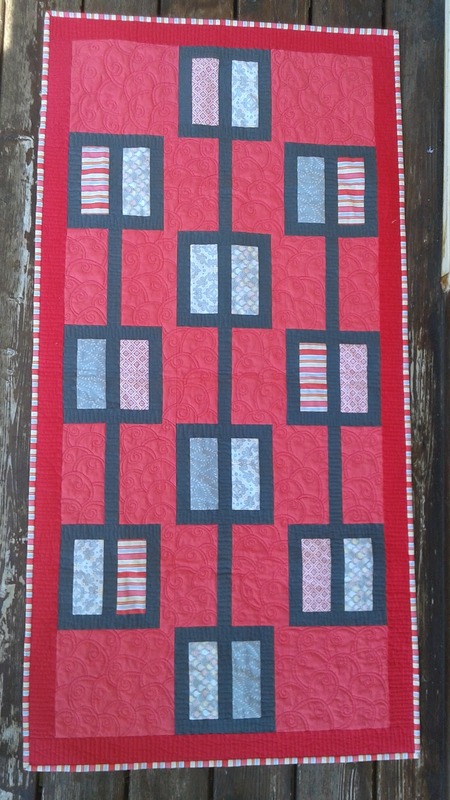 I love your idea of a door hanging and I'll definitely be trying out your background quilting design, so pretty! Great job! I love the idea of decorating a door with a quilt! I have a rather random door in our foyer that is always open, but would look even better with a cute quilt on it! Just lovely! The quilting is so gorgeous. Fabulous. What a great quilt to see on your door. How did you hang it? Your quilt is fantastic! Thanks for sharing it with us. I love the idea of a door quilt - so many options for holidays. Thanks for sharing. I love this pattern - your version is fabulous! I hate to repeat but your version is fabulous!! Nice quilt. I really like the matchbook quilting. The door quilt idea is really great. After awhile you run out of places to put your smaller quilts to use. 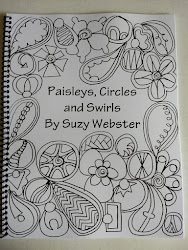 This pattern is great and one I'd like to make--hoping to win a n electronic copy!! grat quilt - love yoru fabric choices! The door idea was inspired! Your background color choice is eye catching. It is certainly fit for a door hanging. Nice. I like your idea of a door hanging. Back to School Blog Hop Starts Today! Blog Hops, Blog Hops, Blog Hops! Free Motion Friday - My New Filler Book!